Need some spring activities to keep young minds active and entertained? We’ve got just the thing! 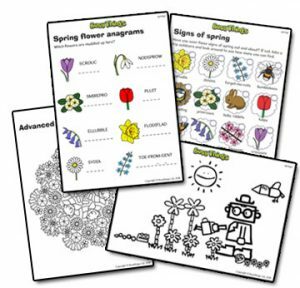 There’s something for kids of all ages in our free spring printables pack. What’s in the spring activity pack? A selection of activities to encourage children to be creative, problem solve and to think and talk about this beautiful season! Kids will love going on a hunt for the signs of spring, get creative with spring colouring and tax their brains with some blooming wonderful anagrams! How to access your FREE spring printables? Access your FREE Spring Printables Pack now! You can access the spring activity and crafting packs within Busy Things, along with tons of other fun activities to put a spring into learning!